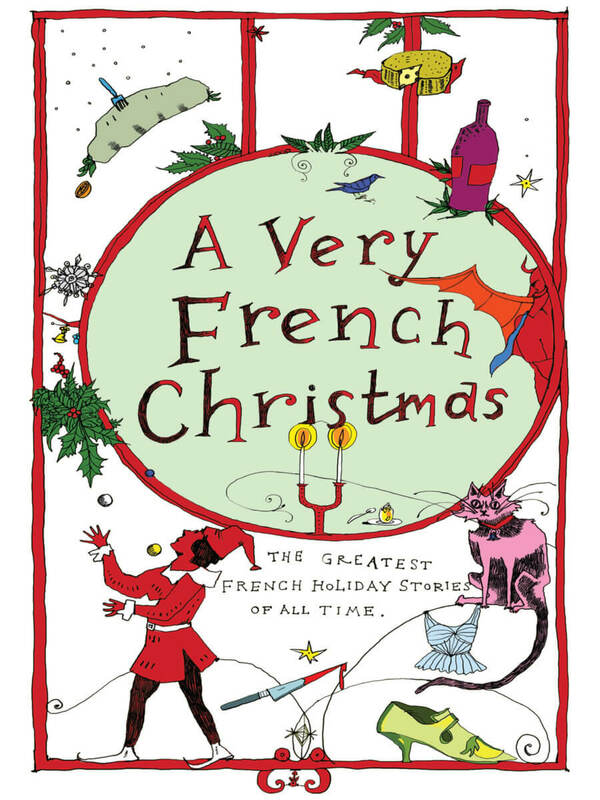 A continuation of the very popular Very Christmas Series, this collection brings together the best French Christmas stories of all time in an elegant and vibrant volume featuring classics by Guy de Maupassant and Alphonse Daudet, plus stories by the esteemed twentieth century author Irène Némirovsky and contemporary writers Dominique Fabre and Jean-Philippe Blondel. With a holiday spirit conveyed through sparkling Paris streets, opulent feasts, wandering orphans, kindly monks, homesick soldiers, oysters, crayfish, ham, bonbons, flickering desire, and more than a little wine, this collection encapsulates the holiday spirit and proves that the French have mastered Christmas. This is Christmas à la française—delicious, intense and unexpected, proving that nobody does Christmas like the French. To be honest, I’ve always loathed Christmas. Of course, it was a bit different when the children were little and ran around the house clapping their hands, but that didn’t last too long. They quickly realized that Father Christmas didn’t exist and that this was just an occasion to get or to try to get things they had been wanting for the past several months. The ideal moment for being angry or sullen because they didn’t receive exactly what they had “ordered.” There’s nothing like the verb “to order” to evoke the year-end holidays for me. But I’m being unfair to them. It didn’t start with their birth, but well before. With my own childhood. My father, who was promoted within his company soon after my arrival on earth, had to move for his new position. My parents didn’t know anyone in the large provincial town where they were to establish themselves. My grandparents lived far away, they were old and in poor health. We didn’t have guests over on the night before Christmas, or New Year’s Eve. We’d hear the neighbors celebrating one floor below. And above us as well. And next door. We were surrounded by party hats and horns. We’d unwrap slices of cellophane-sealed salmon. We cut up the frozen lamb. We savored bûche de Noël bought at the supermarket. All in semi-religious silence, my brother, my mother, my father and I. One might have thought I’d find comfort in my older brother, but we were six years apart in age and he always wanted to escape from this hellish silence, which he finally managed to do very early, leaving me to endure as well I could the meals, the weekends, the holidays and the end of year celebrations. Hélène, on the other hand, adored Christmas. She had the enthusiasm of a little girl, spending hours debating the decoration of the tree (should it be blue and silver or red and gold this year? ), baking cookies, buying Advent calendars, chocolates and spices for mulled wine. It’s because of her that our children love Christmas—there’s no doubt about that. After the divorce, of course, things got slightly complicated. The children, who were adults by then, bent themselves out of shape to not leave their father or mother alone for Christmas Eve or Day. Thibault, the eldest, usually arranged to be with my ex-wife the evening of the 24th and would come to spend the next day with me, while Isabelle and Pierre, the younger ones, did the opposite. Of course, when they each married and had their own children, that all became unmanageable and family gatherings got more haphazard—I certainly didn’t complain about it. Thibault, who for years had been a financial advisor, began to hate his job and suddenly threw it aside to realize his dream of opening a restaurant. But not just any restaurant: typically French cuisine, with locally grown products, all organic. Thibault wanted us to inaugurate his establishment all together the following Christmas—father, mother, offspring, uncles, aunts, cousins —the clan in all its splendor. Hèléne’s heart attack on December 22nd changed all that. She was buried four days later. She was sixty-seven years old. By that time, we’d already been divorced for two decades. We hadn’t seen one another for several months. Following these events, it was decided at a family meeting from which I was evidently excluded that on each and every December 25th, the entire family would now have lunch at Thibault’s restaurant —La Tambouille—the name meant Chow—so that the living could celebrate, open their presents together, and see joy spread over the faces of the youngest while also paying homage to the deceased mother. It’s now the twelfth Christmas since my ex-wife’s death. I’m seventy-nine years old. I’m still in decent shape. Even if my hearing is showing signs of fatigue, my vision is still excellent and I still regularly do fifteen minutes of exercise daily as well as one or two walks a day. Nevertheless, we know—the children, grandchildren and I—that I’m not immortal and that soon, on the 25th, they’ll also be honoring my memory. Like every year for the past dozen, I’m waiting for them. They have to come pick up “Grandpa.” Pierre and Isabelle will probably be in charge because Thibault is busy in the kitchen with his staff. He decided a few years ago that the restaurant should open for lunch on the twenty-fifth. To be sure, we won’t be the only guests, thereby combining the beneficial (that’s to say the profitable) with the pleasurable (his idea of a family gathering is one where he only makes periodic appearances since he’s occupied in the kitchen). We thought the idea was doomed to fail (who after all was going to go out for lunch at a restaurant at noon on December 25th?) but it turned out to be extremely sound. The place is totally packed each year, with tables booked up sometimes six months in advance. Pierre and Isabelle, then, and without doubt one or two members of the third generation, those adorable kids who gradually transform themselves into brooding, unpleasant adolescents and then into impertinent and ironical adults. As always, “Grandpa” gets put in the passenger seat, known as the “death spot,” perhaps betraying a secret desire on their part, even if they all find me endearing, to see me gone and buried so they can divvy up their inheritance; it seems I’m much richer than I appear and that, thanks to well advised investments, I’ve managed to amass a small fortune. They’ve casually tried to ask me about this. I’ve said nothing to confirm or deny the rumor. They tell “Grandpa” how happy they are to see him in good form, they shower him with charming, bland smiles, telling him about the latest exploits of the youngest grandchildren and bring him up to date on the brilliant careers of the eldest. They remind him of the names of the first great grandchildren. And then in the end, when there’s not much of a response beyond a grunt or a gurgle, they lean back in their seats saying that “Grandpa” isn’t so easy going, he always had a difficult character and that doesn’t change with age, he could still be a bit more polite and show a little more gratitude toward this family that spends Christmas Day with him, he barely smiles, it’s true, which seems to prove that he doesn’t enjoy it and that we organize the whole hoop-la for nothing, he’d rather stay at home near the radiator with a book, ah yes, books, for “Grandpa,” you’d think they were more important than human beings. How can they possibly know such things? No member of this family reads novels, except for mass-market bestsellers, clichéd thrillers with contrived plots, idiotic romances or discounted pseudo-eroticism. And so forth. They drag the books around with them during the summer, glancing at a few lines and then quickly going back to their preferred activities—catching up on the latest gossip and convincing themselves that the life they’ve chosen is better than it is. Voilà. The absence of literature, among my children, is the most crushing failure of my existence. It’s not yours, Hélène, I know. You used to reproach my passion for reading. My dilettantism—you used to say there are so many other more interesting and certainly more useful things to do—fixing things around the house, rearranging the furniture, laundry, cooking. Don’t misunderstand me. I did my share of household chores, you can’t say otherwise, but it was never enough. And above all, you started to detest books. But that wasn’t the case at the beginning. We’d finished our respective studies, you always had a novel in your purse, even if you didn’t open it too often. I don’t know what happened to us, Hèléne. Or rather, I do. The kids soaked up our energy and our sense of self. We devoted all our time to them. We were happy to let them devour us. But you see, it’s excruciating, isn’t it, while I’m waiting for them here on the sofa twelve years after your death and probably for not too much longer, while I’m sighing at the idea of losing my first name and my personality to become “Grandpa,” because now even Pierre, Isabelle and Thibault call me “Grandpa” and no longer “Papa,” just as I began to call you “Maman” instead of using your first name; people ought to pay attention to those vocabulary shifts since they’re indicative of the real turn of events—while I’m waiting for them and close my eyes as I listen out for the honking of the horn announcing their arrival, I wonder if we were right. Because the wild part of me, that part that frightened and delighted you at the start of our relationship, the part that you swore to tame and that you managed to subdue until, realizing that a certain routine had become our existence, you began to be bored to death and to find our union so dull that you opted to file for divorce—that part of me that defined me as much as my other, more refined side, more consensual, the lover of books and fine liquors, the mid-level manager of a textile company, a pretty boy who was a bit too affable, that part, I believe I’ve lost. And when you lose part of your identity, you already have one foot in the grave. Don’t worry, the other three will follow soon. I still talk to you, you see, Hèléne. Even though our divorce was finalized thirty-two years ago. Even though after you, there was Lydia, that shapely redhead who you became jealous of when we separated. And then Ludmilla. Olivia. Anne. Elisabeth. Four women in thirty-two years. Two women with whom, in contrast to you, I stayed on good terms. It has to be said that the stakes weren’t the same. We were adults, immune, parents, we knew life wasn’t a bed of roses. I meet them sometimes for lunch or dinner. We get along well. I don’t have the slightest regret. In any case, in my emotional life, I have no regrets. And that includes you, for sure, Hèléne. I’m happy to have shared all those years with you. Well, perhaps not those last five. Only one. In seventy-nine years of life. I can’t complain. There. I hear the horn honking. It’s time for me to turn into “Grandpa,” Hèléne. Leave me. One p.m. Still two hours to go and then I can pretend I’m exhausted and they’ll take me home. I try to put on a good face. I smile when spoken to—it’s one of the rare things that connect me to youth—smiling. I’ve always taken care of my teeth and they’re still in astonishingly good condition for my age. Two implants, a bridge, the rest are original. Their color hasn’t been too spoiled by the cigarettes I smoked with punishing regularity for three decades until stopping abruptly at age fifty. That hasn’t prevented from me from dreaming of taking a puff once in a while—and even from imagining that I smell cigarette smoke in the midst of this group of non-smokers who make up my family and who speak about me in the third person. The stilted thanks, the fake cries of pleasure, the obligatory joy. I join in. I don’t want them to reproach me for spoiling their day. But when I open the packages, I nearly faint. A pair of socks, a bathrobe, a comb; items fit for the hospital or retirement home. Jonas, one of my less irritating grandsons, gave me a watch, a rather ugly metal watch, true, but still it was a present you might receive at any age. Evidently, no one managed to buy me a novel because, as Chantal, Thibault’s wife, declared, “You’re hard to buy for, Grandpa, you’ve read them all, and who knows what you’d like.” It wouldn’t have occurred to anybody to ask me ahead of time for a list, for example. An old guy has no desires, that’s well known. And plus to give me a novel, that would mean going into the center of town, walking into a bookshop—it doesn’t take much more than that. You could buy one at a superstore, but Grandpa doesn’t like novels from superstores, it seems. He’s difficult, Grandpa.